Magento’s Imagine conference has gained its reputation with the participation of some revolutionary speakers like entrepreneur Steve Wynn of Wynn Resorts, best-selling author Malcolm Gladwell, economist and Freakonomics co-author Steven D. Levitt, and many more. Now, Imagine 2017 is back with some amazing agenda to help you design and build a conversion centric Magento eCommerce store. Imagine has lined up discussions and workshops about various eCommerce and retail pain points. The knowledge you could gain is priceless as its not just a text book definition of what you should be doing, but eCommerce legends are going to share what they did to build their brand. Learn from experience and take home valuable insights needed to build a robust eCommerce business. Networking is essential to expand your eCommerce business. Let it be vendors who can give you a competitive edge or shipping solutions that reduce delivery time, you need to know the right people to find information for a scalable business solution. The Magento Imagine 2017 event is the perfect destination where eCommerce solution providers can automate your business processes. Find the right tools and service providers to optimize your online store’s flow to improve your revenue and ROI. Imagine 2017 starts with a fun race, and then extends to three days of events filled with valuable content and activities to keep you entertained and pumped up with adrenaline. Also, the event is in Las Vegas. Need we say more? But we will. You also get to meet and talk to CRO experts from The Commerce Shop and also get a demo of our latest eCommerce personalization tool. This tool will trigger a considerable increase in our customer conversion rate. Designed to be a Magento extension, this tool gives us the competitive edge to help our customers understand their shoppers better. Also, this tool does more than any of the available competitors in the market for an affordable price. We are giving free demos and attractive introductory offers for online store owners who sign up for the tool at the event. 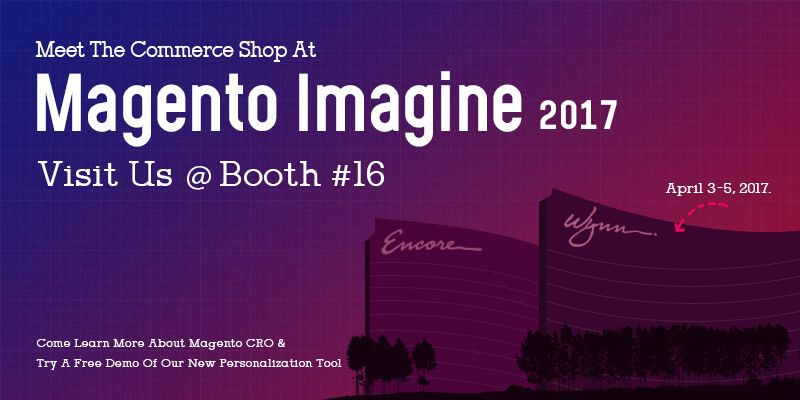 So, get on the flight and get to Magento Imagine 2017 this April from 3rd to 6th. We have four of our eCommerce experts waiting to ease all your worries and build the perfect eCommerce store tuned for maximum conversions. To beat the rush, we suggest you schedule a time with us, we promise to have someone waiting for you.